The team was called in to investigate this private residence in a quiet suburban Albany subdivision on Auckland’s North Shore, where the occupants have reported numerous apparitions, a child seen standing in the hall, touchings and other night time disturbances. Team in attendance – Mark, Barbara and Pam. Weather Conditions on the night – Warm (humid) with a light rain. The house in the Albany lies amongst a large residential housing development which has been around for some 20 odd years. Prior to housing and commercial occupation (which starts directly across the road from the property) the land was used by orchardists. The most prominent and last land owner was the Clemow family. There have been settlers in the area since circa 1840, however prior and during this period the land was also used by local Maori. There are many streams that run through the area, one adjacent to the northern boundary of the property. It seems one of the streams has been piped under some of the new houses in the area. The house borders a main road, the local traffic reports and council website indicate there have been many road accidents on this road over the years. We couldn’t locate any particular deaths within the immediate vicinity but definitely within the area there have been. Goodness knows how many people have passed prior to modern occupation. At one point there was a murder, the body found in one of the streams. This was in the 1800’s. It was reported to be a land dispute matter. There have been only two owners of the house. The layout downstairs was rather maze-like with rooms off rooms. There was a large garage/bar area, an entry hallway, a bathroom/toilet, an open plan lounge/dining nook/kitchen, a toy room, a separate dining room and a computer room. Upstairs was a hallway, three bedrooms (one with en-suite), a toilet and a bathroom. The family reported that the young boy living at the house had been touched a couple of times. Four people have seen apparitions which all seem to be of different people. One person has seen a woman, another has seen a young girl and another has seen two children (who she sensed were twins) and another saw a small dark headed boy. The family had heard a loud squeaky toy sound in the kitchen one night. The owners and children apparently have no squeaky toys. One family member reported difficulty sleeping in her own room but was fine to sleep in the lounge. A group of teenagers had played with a Ouija board and had “contacted” a teenage girl. The family believe that this Ouija board session may have opened a portal of sorts, allowing something into the home. Pam – The occupants of the house explained their varied experiences. Several apparitions have been seen upstairs by both the mother and the daughter. The mother says she has sensory abilities regarding spirits so I do wonder how much of this has been (over the years growing up) passed onto the children so that it becomes accepted that there are ghosts in all houses? The Haunted Auckland team arrived at this home on a wet and humid Auckland summer evening. After the initial interview and a tour of the home and hearing details of the alleged activity, the family all gathered into their converted basement / garage / party room / bar and left us to conduct an investigation of their home. As there were other people present in the home with us, we were unable to hold a fully controlled investigation. We took hundreds of internal and external photographs to document the surroundings, static video cameras were positioned to record the bedrooms and hallways that have had activity. Audio recorders were used in fixed position and hand held recordings. Full atmospheric, ambient and surface temperature and Energy field sweeps of the home were done at intervals. Data was noted at three times during the session. Barbara – It was a large family home with lots of little rooms and a very unusual layout. Pam – I instantly noticed that the colour of the walls made me feel oppressed. They were mid dark coffee coloured which I really got a negative feeling from. I found it quite depressing. I didn’t get a sense of anything out of the ordinary though. Throughout the night the temperatures stayed relatively steady and unmoved. Ranging from 24 degrees in the first bedroom, 25 upstairs toilet, 24 hallway at top of stairs, 24 master bedroom, 24 upstairs bathroom, 24 upstairs hallway, 24 upstairs bathroom, 24 3rd bedroom, 24 bottom of stairs , 25 toy room , 24 living/lounge room , 24 dining nook, 24 Kitchen, 24 Dining, 25 Study/Computer room, 24 Downstairs Hallway. Surface temp downstairs : 24 Lounge, 24 Dining, 23 Kitchen, 23 Study, 23 Downstairs Hallway. No unusual fluctuations or spikes were detected anywhere. The only inconsistency noted; The Ambient temperature had dropped a couple of degrees in a kids toy room downstairs, however this was due to one outer facing wall being almost all glass window. The toy room had a much higher surface temperature than the ambient temperature. We also attributed this to the room being closed up until Mark opened it up to note the temperatures. Barbara – By the time I got to the room to take the ambient temperature it had been open for a couple of minutes and some of the trapped heat had been let out. Communication attempts were held in three of the room claiming activity, though controlled experiments weren’t possible due to the family being downstairs talking in the garage and the noise of car tyres on the wet road outside. At the conclusion of the investigation a full energetic ‘clearing’ was done by Barbara and Pam in the hopes of ridding the home of any negative energies. Mark – I thought we did all we could with what we had to work with. All up it was a nice relaxed investigation and the family were helpful, friendly and welcoming which made the experience easier. I personally didn’t see, feel or hear anything to lead me to believe the home might be haunted, though that doesn’t mean the home ISN’T haunted. The family all claim to have had interesting experiences and have described them in good detail, so these claims can’t and shouldn’t be dismissed. As we were only there for a few hours, the chances of capturing something were low, but with an interesting EVP and a photo that hasn’t yet been explained with any practical reasoning that fitted the time and scenario, we felt we hadn’t come out empty handed. There was a lot more we could do with more time and an empty house if a second, follow-up investigation is required by the family. Barbara – The whole house had an odd feeling about it – almost as if there was something emitting high energy close by. (Although the EMF readings were not elevated). I suspect that the house involved in the investigation would not be the only house in that immediate area where the occupants were having problems. My camera had its battery drained while in the upstairs hallway. This has never happened in the past and I have used the same camera since and had no problems with it. Also during an EVP session, I felt a cold spot on my left shoulder, although the thermometer did not corroborate this when we checked. While in the upstairs hallway it felt like someone ‘touched’ my hair. I thought we were fairly thorough under the circumstances. It was difficult with the family being present in the house at the time. I saw nothing during our investigation that would make me believe that this house was haunted. The house did have an interesting feel about it and felt as though the air was slightly charged with energy. I suspect that if we were able to set up more cameras and monitor them over a few days we may catch some sort of activity. Pam – In summary, I don’t feel I experienced anything at all at the Albany investigation. Obviously if we are there for such a short period of time, the chances aren’t great for something significant to happen. The general vibe for me wasn’t one of discomfort. I do think that with the mother feeling she has psychic abilities, this will have been discussed in the house for many, many years and will have had a run-on effect on both the daughter and grandson. They didn’t seem to mind the child hearing the general conversation and he obviously knew we were there for some strange reason so I would assume he knows all about the experiences in the house. I do wonder if the experiences are in part brought on by the interest in the subject matter of everybody in the house, including the father who has had his own experience in the past (different house). 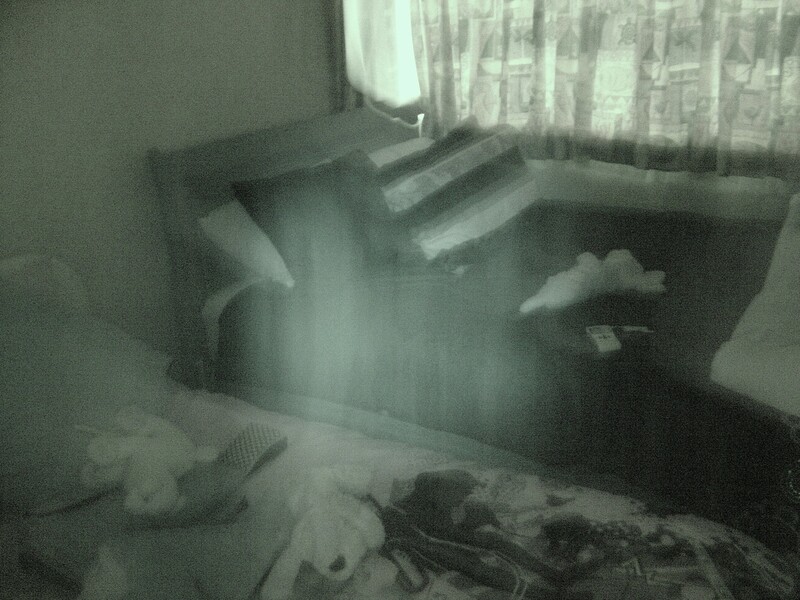 The following photograph was taken in one of the bedrooms using an infra-red camera. There was still some light coming in from outside, however photograph shows what appears to be some sort of mist between the two beds. Multiple attempts to replicate this effect were attempted using the same model camera, under a range of lighting conditions, camera settings, various reflective materials, camera shaking and movement, and even by generating fog. However none of our attempts were able to generate anything similar to what is shown in the photograph. It’s exact nature remains unexplained. 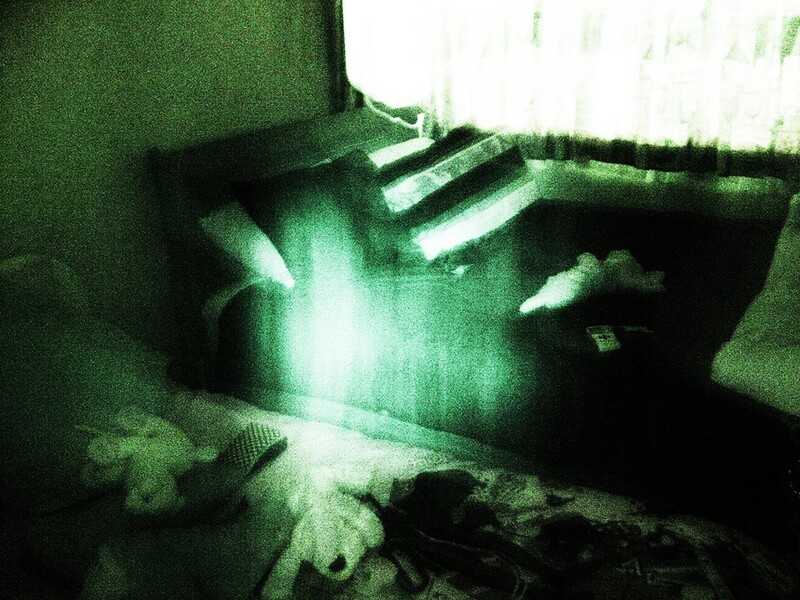 A photo captured in one of the rooms of an unusual infra-read “mist”. Contrast enhancement of unusual infra-red mist. Hello. I actually Googled Albany Auckland looking for a house with similar details from when I was a kid me and my brothers lived in a house I was too young to remember layout but I remember lots of other things as well as my brothers about our house when we lived in Albany I’m the youngest I but I wonder if it’s the same one as we sometimes mention to this day. My mum has only in recent years admitted there was something wrong with the house. I’m now 33 and I still have memories of things that happened there.